There are some books you read that you know that everyone should read as they give an inner voice to topics that you won't necessarily find around you, and this one is Wishbones. A heartbreaking but hugely important read, I am delighted to be on the blog tour for this incredible book today. 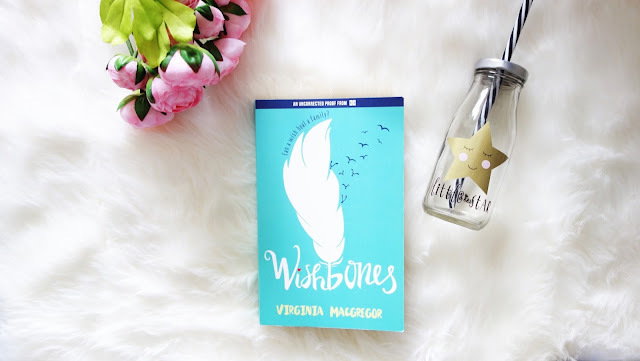 As part of the tour I am sharing my thoughts on Wishbones and there is also a chance to win a copy of the book at the end of this post. Wishbones was read with a heavy heart. If there was ever a book to draw out so many emotions, it's this. Feather's Mum is obese and hasn't set foot outside her home for thirteen years. Things have been ticking along just fine, or so Feather has been lead to believe until her Mum, Josi lapses into a diabetic coma. Feather knows she must do all she can to get her Mum healthy again, not as easy said than done. When her Mum isn't as cooperative as Feather would have hoped, she begins to realise that the problem runs deeper than her size. She decides to make it her mission to get to the bottom of how her Mum's weight spiralled out of control, but again this isn't as simple as it sounds, especially when Josi won't talk to her. It soon starts to seem that everyone except Feather knows what happened all those years ago, but she is determined to find out the truth. Eating disorders are a topic that have been in the media for many years now, but are a surprisingly lacking subject in YA, especially when it comes to obesity. There is a horrible stigma around obese people in that they are simply greedy and have no willpower. What people forget is that there is a person behind all that and that problems can run deeper than simply overeating. Virginia portrays that through Josi, that although you will find yourself feeling incredibly frustrated with her and initially thinking that she is selfish, you are quick to realise that they stem from depression and cannot be made better simply because someone tells you you need to get better. You can completely see Feather's point of view though in that she just wants her Mum to get better because she doesn't want to lose her. There were some other characters in Wishbones that you won't expect, but this wouldn't have been the story it was without them. There's Jake, Feather's only and best friend in the world. Mrs Zas, Ukranian costume shop owner, Houdini, Feather's unusual pet and Clay who is dealing with something similar to Josi and has an interconnecting story of his own. There are a lot of heavy topics in Wishbones that when my own life isn't going so great, really hit home. However it got me thinking outside of my own little box as it were and made me realise that there is never a clear cut solution to everything, just as Feather discovers. Wishbones may make for some hard reading but it also has some heartwarming messages to take away. It's important not to overlook the good things that you have in your life, as it's easy to get brought down by the bad. A tough read, but an important one and another YA author giving a true voice to those topics that the media heavily distort. For a chance to win one paperback copy of Wishbones, enter via rafflecopter below. UK Only, ends 26th May. Thank you for the opportunity to win, it means an incredible amount <3 I'd love to win because it hits close to home with topics such as eating disorders and depression - the former a battle which I have won but the latter I'm still suffering. Reading YA books surrounding mental health offer a sense of comfort and understanding, and there'd be nothing else to make me happier than to win a copy of this! You are right, it's not a subject that does seem to be as extensively written about in YA as much as some others. This sounds like a very thought-provoking read. I'd love to enter the giveaway but having read Fatimah's touching comment, if I were to be lucky enough to win, perhaps you could send it to her?